The Ultimate Guide to the Best .NET E-commerce Platforms for 2019! Choosing an e-commerce platform is one of the most important things you have to do when you’re starting an online business. There are many factors you need to consider - features, extensibility, pricing, programming language, etc. For developers the underlying technology is the most important factor. Since you're here, you've probably decided on an ASP.NET based e-commerce platform. But choosing the best option is not a straightforward task. We publihed a separate blog post for each of these platforms. Today's post is a summary of the most important information we discussed in these articles. 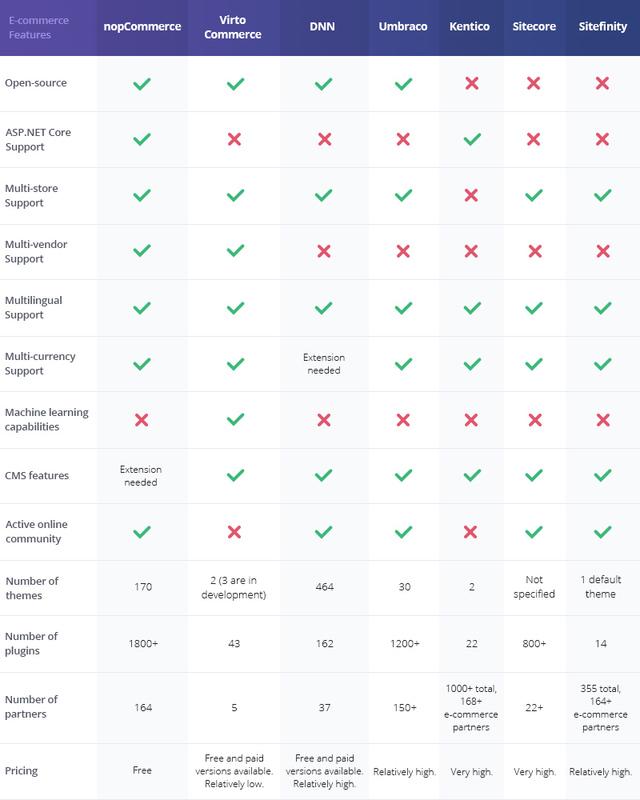 It also contains a compact comparison table that will give you a bird's eye view of what each platform can offer. 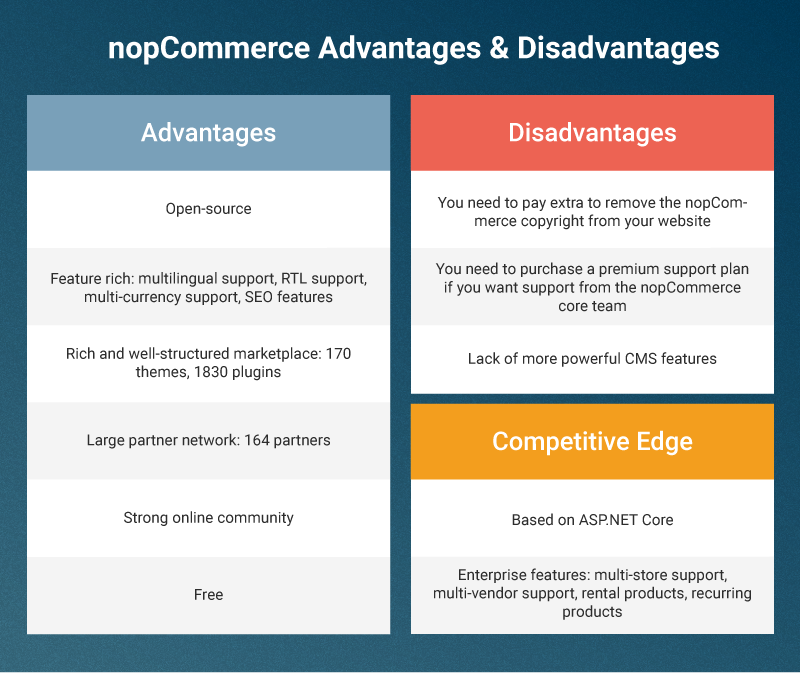 NopCommerce is a free and open-source e-commerce platform. Based on ASP.NET Core, it is a highly scalable, robust and secure system. Its architecture is clean and modular which allows developers to easily control and customize the front-end markup and the back-end functionality. Highly sophisticated e-commerce websites, themes, and add-ons can be developed on top of nopCommerce. And because of the system well-structured architecture, all websites and extensions can be easily maintained, extended and upgraded. NopCommerce was launched in 2008 in Yaroslavl, Russia. Eleven years later the platform boasts an ASP.NET Core (Microsoft’s latest .NET technology) architecture, a vibrant community, a well-developed extensions marketplace, a strong partners network and roughly 30,000 websites. Among these are no other than Volvo Cars, Reebok, Elton John, Celine Dion, BMW, Turkish Airlines, and Govx. Based on ASP.NET Core. ASP.NET Core is Microsoft's latest .NET Core web framework. Open-source. NopCommerce is community-driven and its source code is available on GitHub. Extendable architecture. Developers can extend and customize the system without interfering with the platform's core architecture. RESTful API developed by Nop-Templates. Multi-store. You can run more than one online store in a single nopCommerce installation. Multi-vendor. You can create marketplaces on top of nopCommerce. ACL. You can control the access to each product, category, vendor, etc. SEO features. Sitemap support, Open Graph META tags, breadcrumbs, canonical URLs, etc. CMS features. You can create a blog, forums, custom pages, and more. Note that the nopCommerce blog offers only basic functionality, enough to get you started. If you need additional features for your blog you can purchase a rich blog plugin. Product attributes. Size, weight, color, etc. Rental products. You can rent out products. Recurring products. You can offer subscriptions. Downloadable products. You can offer digital products such as e-books, online courses, music or software. Reward points program. You can reward your customers for every dollar they spend on your website. Multiple payment methods. Paypal, 2Checkout, Square, Amazon Pay. Multiple shipping methods. FedEx, UPS, Cash on Delivery, Pick up in store, etc. These are only some of the features nopCommerce offers out-of-the-box. Of course, if you need anything outside the default functionality, you can look for it on the nopCommerce marketplace or hire a .NET developer. There are 170 free and paid themes in the nopCommerce marketplace. There are also 1830 plugins - language packs, payment modules, user interface & widgets, shipping & delivery, marketing & sales, administration, customers, and security. NopCommerce has a highly active community. The nopCommerce forum contains hundreds of active discussions and new posts appear every day. Asides from the community, nopCommerce is strongly supported by its 164 solution, technology and hosting partners. However, if you want to remove the “powered by nopCommerce” link from the footer of your nopCommerce website you will have to pay $250 for a copyright removal. But you can also buy this key for only $63 from a solution partner like Nop-Templates (provided you purchase a theme). 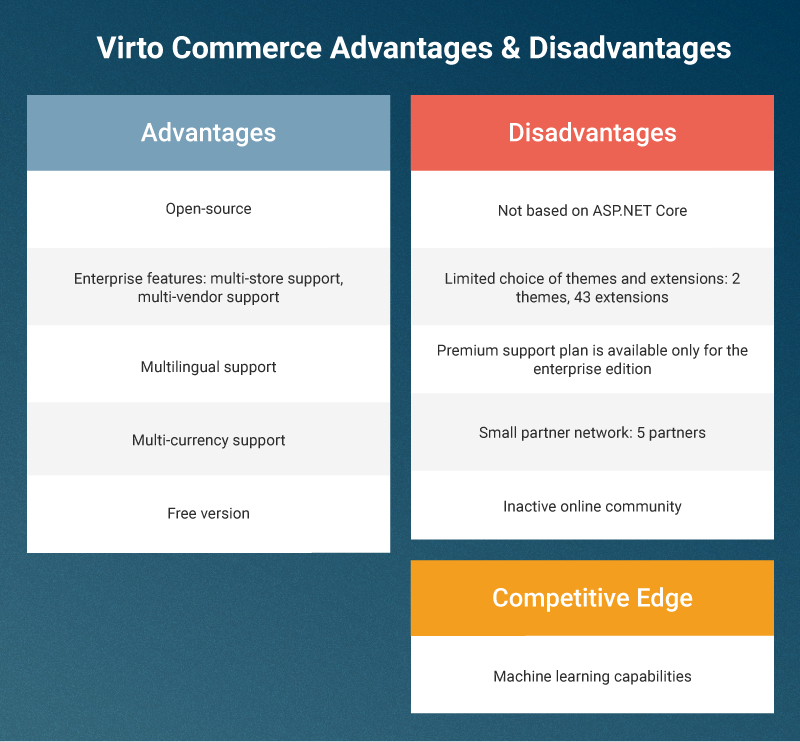 Virto Commerce is an open-source ASP.NET e-commerce platform suitable for small businesses, as well as for medium to large B2B and B2C e-commerce companies. Virto Commerce was launched in 2013. Interestingly, the team that created Virto Commerce was also the creator of the Mediachase e-commerce framework. Modular enterprise .NET e-commerce platform architecture. The core functionality of Virto Commerce can be extended with modules and capabilities. Product Information Management (PIM). You can manage different types of products: digital, physical and subscription-based. You can also integrate your store with third-party PIM solutions. Advanced Catalog Management. You can manage complex B2B and B2C product lists, multi-store catalogs, no-database catalogs, virtual catalogs, and more. Promotions engine. You can create discounts, coupons, promotional banners, and various campaigns like product and shipping promotions. Content Management System (CMS). Blog posts, banners and landing pages come out of the box. However, if you need more power and flexibility, you can integrate your store with leading content management systems like WordPress, Orchard CMS, and Umbraco. Responsive pricing engine. Prices can be personalized based on audience, purchase history, location, and more. Tier pricing and custom currencies (such as bitcoin) are also supported. Distributed order management software. Virto Commerce can be integrated with leading IMS, ERP and accounting systems. The Virto Commerce marketplace offers 5 themes (free and developed by Virto Commerce) and 43 extensions (payment gateways, content and customer management modules, inventory management, integrations, and more). DNN is an open-source CMS based on ASP.NET Web Forms. You can create pretty much any web system on top of DNN including e-commerce, intranets, public websites, or any custom web application. 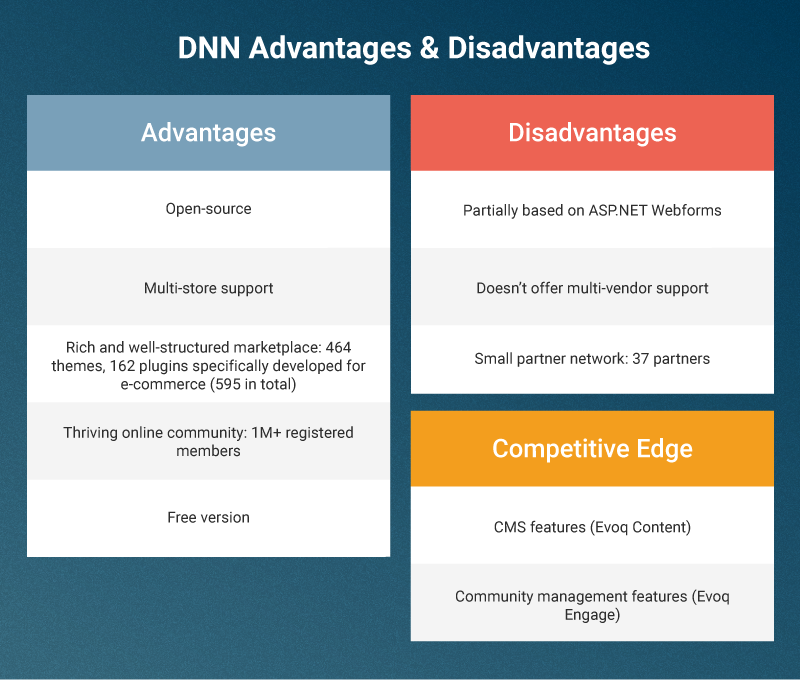 DNN was started in 2003 and since then has evolved into a leading ASP.NET open-source CMS. Through the years the company has received financing, acquired a marketplace (Snowcovered), and launched a partnership program. It is currently owned by ESW Capital. DNN is still roughly 20% based on the legacy ASP.NET Webforms. The DNN team has been working frantically for the past three years to make it possible to evolve to the latest .NET platforms. Many of the core components have already been ported to .NET Core but many are still Webforms and rely on objects like Server and Request. Only the DNN platform is free. The other 3 DNN editions are paid and as such offer more advanced CMS features like a drag-and-drop content builder, SEO tools, content analytics, integrations (Google Analytics, Microsoft Azure, DropBox, etc. ), community management, enhanced performance, and more. DNN offers 464 themes and theme collections. It also offers 595 plugins. 162 of them are e-commerce extensions. You can find them in the ‘E-commerce’ category. DNN has a thriving community of more than 1 million members - developers, designers, marketers, store owners, etc. The DNN forum is highly active and is the main venue for this community. DNN is also strongly supported by its partners. The DNN partner directory consists of 37 partner companies. 19 of all 37 partners have listed e-commerce as one of their competencies. The DNN platform itself is free. Umbraco is an open-source CMS based on ASP.NET. Umbraco doesn’t offer e-commerce features out-of-the-box. For this you need a third-party e-commerce solution that integrates with Umbraco. Such are Ucommerce and Merchello. The first prototype of Umbraco was built in 1999. In 2003, the first version of Umbraco was released. Since then the system has seen many new releases, has won several CMS awards and has established itself as the leading .NET CMS platform. Umbraco Headless - the new way of providing the Umbraco data to any project. Umbraco Headless exposes the CMS data in JSON format through an API so that it can be consumed by an Umbraco Headless client in any application and on any device. 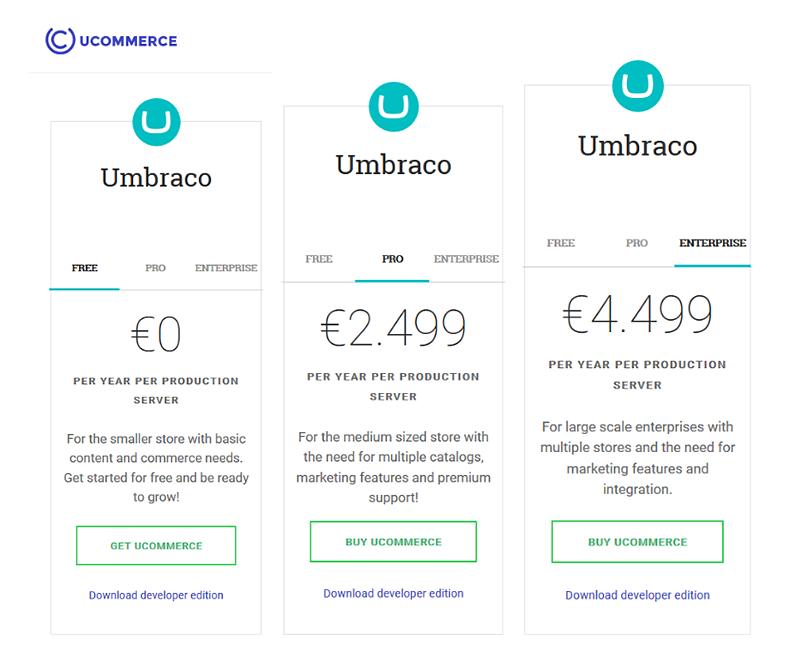 Ucommerce for Umbraco can run on Umbraco CMS (an open-source free version of Umbraco) and Umbraco Cloud (a cloud version of Umbraco that enables you to host your website in Microsoft Azure). Ucommerce is built specifically for Umbraco. This makes it the most powerful and seamless e-commerce solution for the popular ASP.NET CMS. There is no official marketplace for Umbraco themes. In fact, theming is not popular with Umbraco because it is hard due to Umbraco's extremely customizable structure. Still, there are third party providers like uSkinned and BindTuning who offer Umbraco themes. Umbraco offers more than 1200 extensions on Our Umbraco. Umbraco partners with more than 150 companies. The Umbraco community is highly active and the Umbraco forum has more than 200K members. You can start for free and upgrade to a paid version once your business scales. Merchello is open-source and free. You can support the project by purchasing a Gratitude Licence for $100. 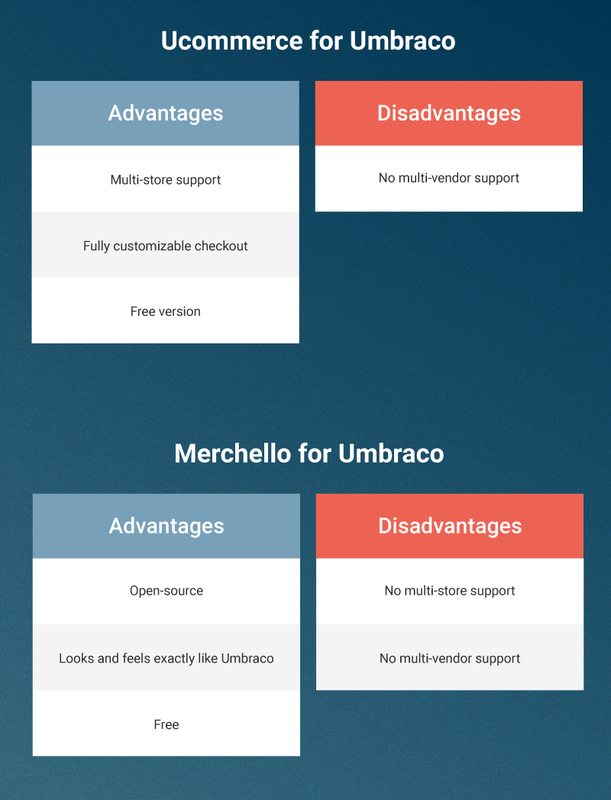 E-commerce is available for Umbraco through third-party solutions like Ucommerce and Merchello. Kentico is an ASP.NET CMS and offers e-commerce features out-of-the-box. Kentico was founded in June 2004. Тhe same year Kentico 1.0 was released. Today Kentico powers more than 25,000 websites and has established itself as one of the most modern content management, e-commerce and online marketing systems. The company has won several awards for its product and has become a strong player in the CMS industry, employing more than 200 people with offices on three continents. There are only 2 e-commerce templates in the web site templates category of the Kentico Marketplace (DevNet). There are also 22 e-commerce extensions - payment providers, email marketing modules, currency converters, third party integrations and more. Kentico has more than 1,000 partner companies. We can assume that Kentico does not have a very vibrant online community since the Kentico forum has not been active since 2014. Click here for more information on licence conditions and pricing. Sitecore is a web content management platform based on ASP.NET Core which also includes an integrated e-commerce solution - Sitecore Experience Commerce. Sitecore Experience Commerce seamlessly merges web content, e-commerce management and data about customer interactions and preferences. As a result, it enables you to deliver relevant and personalized customer experiences in real-time and across multiple channels. The new Sitecore version 9.0 includes the Sitecore Experience Accelerator (SXA) Storefront, with which you can develop and deploy e-commerce storefronts through the Azure marketplace or on premise. Sitecore was founded in 2001 in Copenhagen, Denmark. 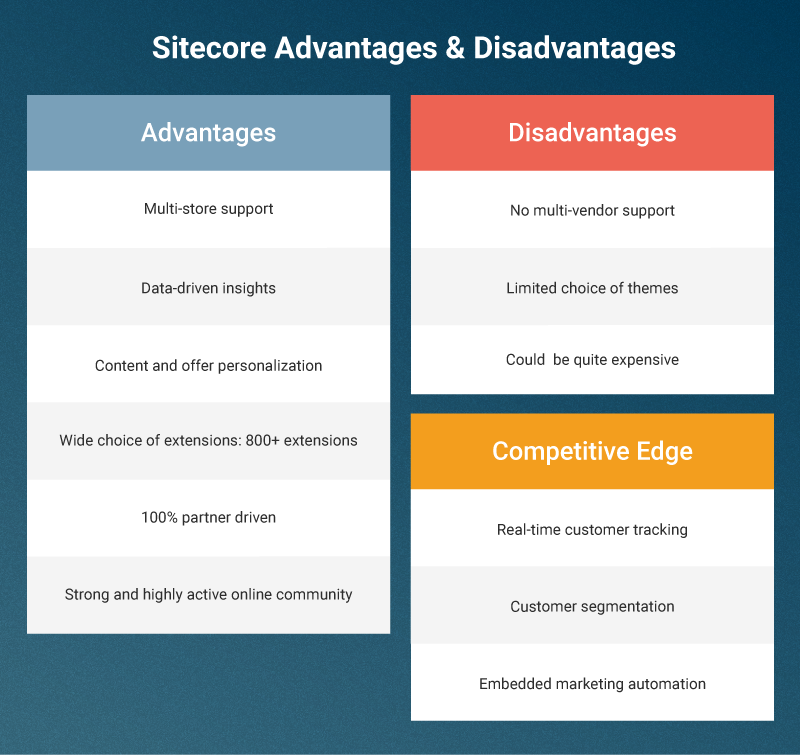 Today Sitecore is a global provider of web content and customer experience management software targeting enterprise retail companies and big marketing service providers. Sitecore’s portfolio of clients includes Canon, Suzuki, L’oreal, Dow, and more. Sitecore has won multiple awards and was recently named a Web CMS Leader in the Forrester Wave Web Content Management Systems, Q4 2018 report. All of the Sitecore system including its constituent products (Sitecore Experience Manager, Sitecore Experience Platform, and Sitecore Experience Commerce) use a microservice architecture. This means that the Sitecore Experience products are extremely flexible, powerful and scalable. Each Sitecore service implements a number of logical roles or entities, each representing a certain function in the system, like the persistence of data to a particular data store. Click here if you need more information on the Sitecore architecture. A drag-and-drop editor allows you to use more than 40 e-commerce controls. This way you can easily create any product, collection or landing page you want without the help of a developer. Real-time customer tracking. Sitecore records customer interactions and preferences and learns from this data. Then it provides you with valuable insights and enables you to deliver personalized and relevant customer experiences. Customer management. You can manage, tag and segment your customers. Inventory management. You can manage inventory for multiple stores and warehouses. Order management. You can fulfil, hold, cancel or delete orders, do returns and refunds, add, edit, or delete items from pending orders, and more. Promotions management. You can either use one of the 22 promotions that come out-of-the-box, or you can create your own promotion based on various rules. Seamless integration with back-office systems such as CRMs, ERPs, etc. There are no ready-made themes for Sitecore and it could be quite hard to create such given the enormous versatility and power of the system. Also, most of Sitecore clients are big companies who in most of the cases prefer custom and unique designs. So there isn’t really a market for Sitecore themes to justify the development of such. Still, the front-end of any of the Sitecore Experience platforms is themable and all Sitecore designs are implemented as themes. But when it comes to plugins, things are much different. There are more than 800 plugins on the Sitecore Marketplace that serve various functions: administration, client features, visitor interactions, commerce, translation and localization, website optimization, setup and deployment, and more. Solution partners - companies that build Sitecore solutions for customers. Technology partners - companies that complement and extend Sitecore with their solutions and services. The Sitecore forum is quite active with thousands of posts and new posts appearing every day. The price of the Sitecore products varies depending on the customer use case: number of monthly visits, number of installations, add-ons, etc. There is no official information how much Sitecore products and solutions cost. Click here if you need more information on the license models, or want to get a quote. Sitefinity is a .NET CMS platform based on WebForms and .NET 4.7. It sports roughly 10,000 websites worldwide. 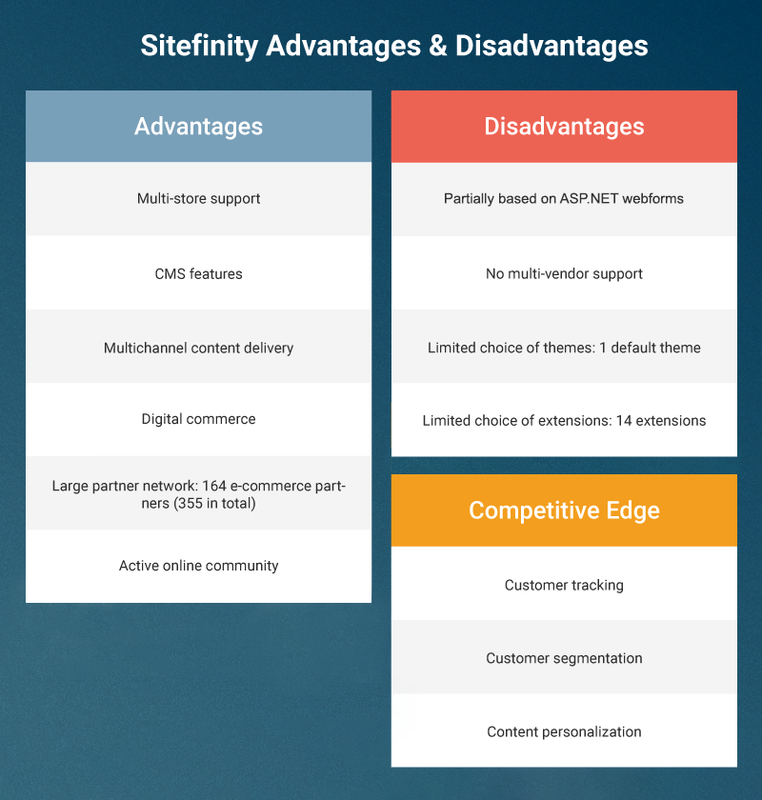 In addition to its various CMS features Sitefinity offers a digital commerce solution. Sitefinity CMS and all Sitefinity products became part of the Progress portfolio when Progress Acquired Telerik along with their aweome .NET tools. ASP.NET 4.7 support. With a few caveats, Sitefinity also supports ASP.NET MVC 5. Although Sitefinity is based on WebForms, developers can still extend the system using ASP.NET MVC 4.7. But the forum and, most importantly, the e-commerce widgets cannot be customized only through ASP.NET MVC. Rather a mix of WebForms and MVC needs to be used. Integration with third-party CRMs, ERPs, RSS feeds, etc. Sitefinity has a single theme which is the default one: The Light backend theme. Of course, you can also create your own themes. Click here for more information on Sitefinity themes and custom theme development. The Sitefinity Marketplace is small. It offers a few integrations, most notably with UCommerce and a number of language packs. Progress has 355 partners which are organized by area of interest, industry, product, country, and name. The Sitefinity partner directory includes 164 companies. In addition to its partner network, Progress has an online community which is quite active and sports more than 50 forums on the Progress Community Website. You do need to contact the Sitefinity sales team if you are interested in obtaining one of these editions. Apart from Sitecore and Sitefinity, all platforms we discussed above are open-source. Only nopCommerce and Kentico support ASP.NET Core. Apart from Kentico, all platforms support multiple stores. Only nopCommerce and Virto Commerce support multiple vendors. All platforms offer multilingual support. NopCommerce even offers RTL (right-to-left) support. Apart from DNN, all platforms support multiple currencies. The only platform that has machine-learning capabilities is Virto Commerce. 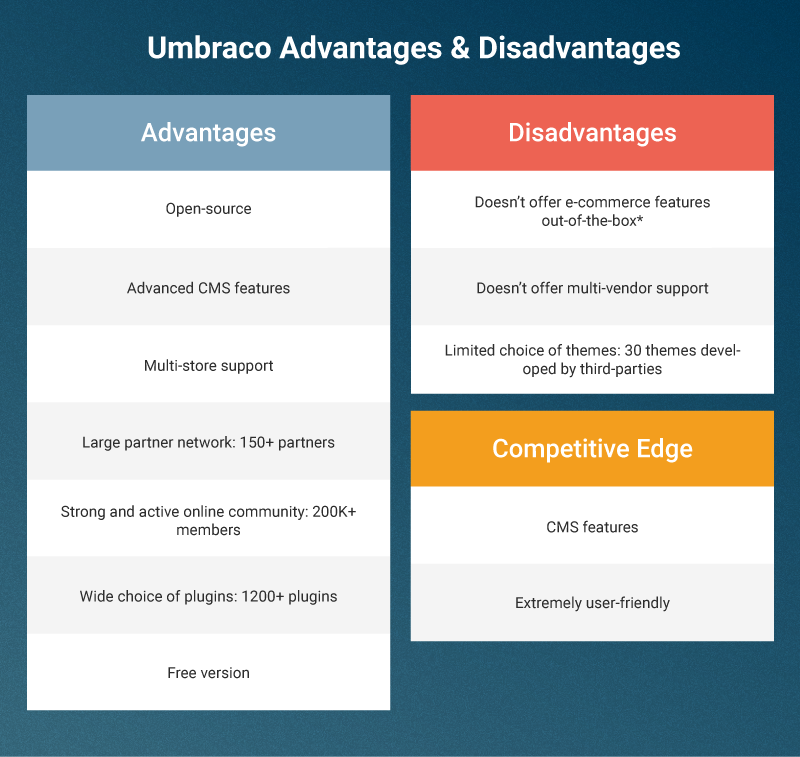 NopCommerce and Umbraco have the strongest online communities. Virto Commerce and Kentico have the smallest. NopCommerce, Umbraco, Kentico, and Sitefinity have large partner networks (150+ partners). Virto Commerce and DNN have relatively small partner networks (less than 50 partners). Currently, Sitecore’s solution partners are not listed on their website. Therefore, the number of their partners cannot be specified. However, we can say for sure that they have 22 technology partners. Out of all platforms only DNN and nopCommerce really offer a good amount of themes. NopCommerce offers the largest selection of e-commerce plugins (1830), followed by Umbraco (1212), and Sitecore (800+). 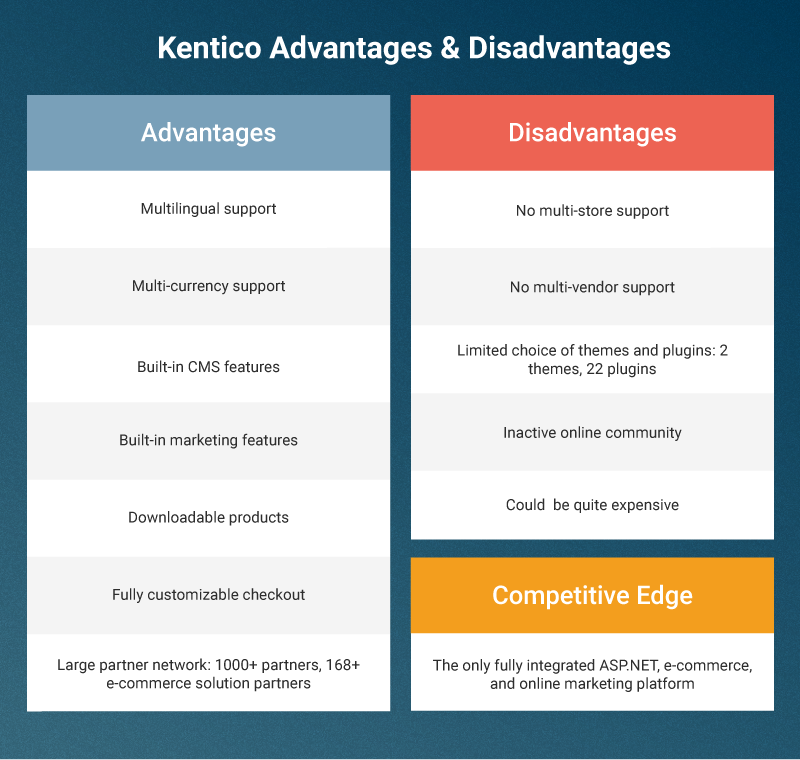 Virto Commerce, Kentico, and Sitefinity offer less than 100 plugins each. Ultimately, each ASP.NET platform we discussed is a robust solution. But as entrepreneurs looking to base our e-commerce development business on one of these platforms, it is very important to take into account the technology and the ecosystem of the platform. A .NET e-commerce platform that is actively developed using the latest technologies and has a strong ecosystem (online community, marketplace, partners) will, without a doubt, provide much more scope for growth and success. We hope this guide gave you an insight into the world of ASP.NET e-commerce platforms and will help you choose the one that best meets your needs! If you have any questions, remarks, or suggestions, drop us a line in the comments section below!